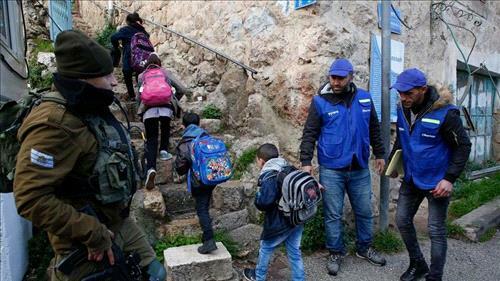 AMMONNEWS - Palestinians in the occupied West Bank city of Hebron escorted children to school Sunday, saying protecting them from Israeli settlers was necessary following the withdrawal of international monitors. Israeli Prime Minister Benjamin Netanyahu announced last month he would not renew the mandate of the Temporary International Presence in Hebron (TIPH), accusing it of bias. The mission left on January 31. It was established after a massacre of Palestinians in 1994 and Palestinian officials warned the withdrawal of the international monitors could increase abuses by settlers in the city. Palestinians from the Youth Against Settlements organization accompanied children to schools in vests with the word “observer” written in English, Arabic and Hebrew an AFP photographer said. “Today we started a local campaign to document violations that children going to school are subject to in this area where there are always settlers and the occupation army,” Issa Amro from the organization told AFP. Small scuffles broke out between Israeli settlers, the Palestinians and Israeli soldiers during the walk, the AFP journalist said. TIPH was created after 29 Palestinian worshippers in a mosque were gunned down by an American-born Israeli settler. Observers carried out daily patrols and document rights abuses they witness, although they were not allowed to intervene. The mission reported its findings to its member countries - Italy, Norway, Sweden, Switzerland and Turkey - as well as the Israeli and Palestinian authorities. Hebron is holy to both Muslims and Jews and has been a flashpoint in the Israeli-Palestinian conflict. At least 600 Jewish settlers live under heavy military guard in the city, which is home to around 200,000 Palestinians. Israeli settlements are seen as illegal under international law and a major obstacle to peace, as they are built on land the Palestinians see as part of their future state.